circumatances. Alan was repairing, building and designing tape recorders arid sound equipment. Later they made among other things amps in their own namn and for Vox. guitars were made. 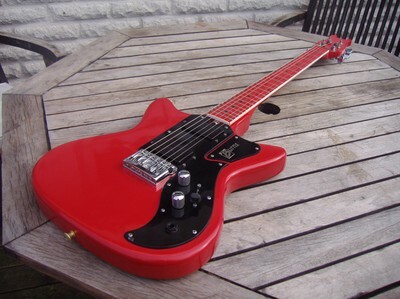 Jim also designed a few more guitars and basses and also made strings. 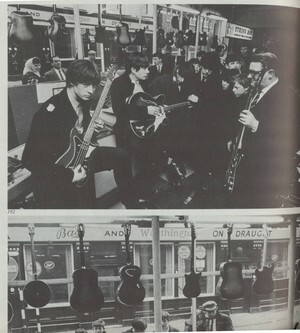 Unfortunately I am unable to verify if these guitars in fact ever appeared on the market. The relationship ended on a somewhat sour note as Jim started making strings to rival companies. Jim left the company in 1959 and joined forces with Henry Weill under the Burns-Weill banner. contribution from Trevor Migley, who knows the story best. 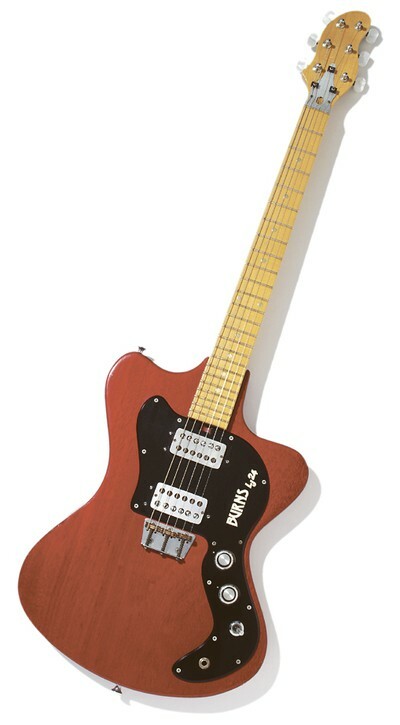 The guitar below is a Supersound prototype made by Jim Burns. 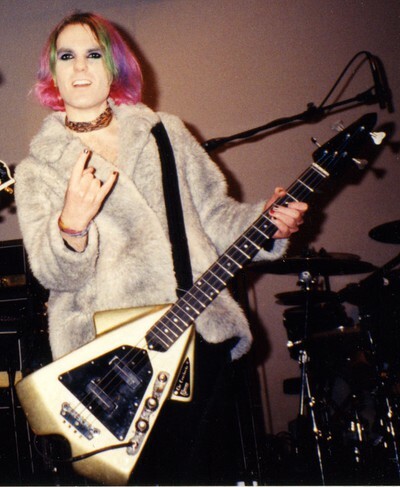 "Jim Burns was a master in marketing and he used the Burns name to full extend to sell a full range of guitar related accessories like amplifiers, speaker cabinets, strings, guitar effect units, amplifier stands, microphones and even a portable power point. From the Alfons Lahaye collection come these pictures of various string types. 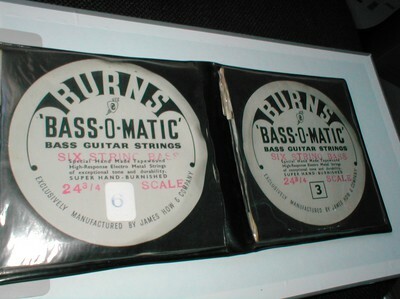 All these strings were made by James Howe Industries of Kent, England, now a days the leading European manufacturer of roundwound strings. But these didn’t exist in the sixties; it was all flatwounds and compared to today with rather heavy gauges." You will learn more about the different Burns strings in the book. a contributionabout the early Burns pick-ups. Adrian: - " 60’s Tri-Sonic has become a revered and highly sought after pickup, noted for it’s rich, smooth, powerful tone and pleasing good looks. Original, unmolested examples now command ever increasing high prices and one good single unit, can often exceed the original price of the instrument it was once affixed to. Although Jim Burns can not be held solely responsible for the design of these classic units, it is fair to say that without his stylisation and adaptation of the original theme – the classic sound we have come to know and love would never have happened." The chapter contains much more then the story behind the Tri-Sonic. This contribution will give you the whole story. Thank you Adrian. If you have some thoughts about my Burns-blog, please click on "kommentarer"
I have made some intervjues with people who had relations with Jim Burns Ltd in the 80:s.
Below you see a picture of one prototype from the 80:s. A very special Magpie. 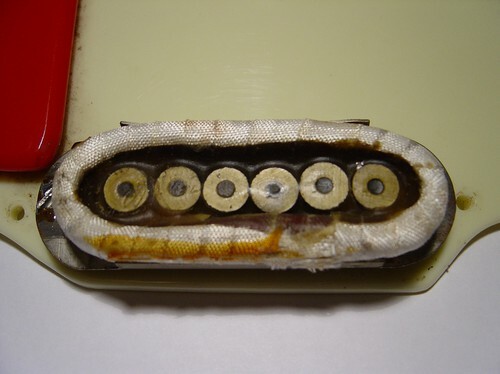 In the book we did not write much about the story about "the crazy diamonds" from the 70:s.
to the very nice LJ 24. "As you know, we originally called the guitar Concord because that is what had inspired Jim to design it with the ‘droop-nosed’ head and swept-back ‘wings’. Even the pick-ups were designed to suggest the shape of the Concord planes’ under-carriage. Publicity photographs and brochures were produced using (for the time) state of the art images of earth taken by NASA from Space. However, just as we were finalising the artwork for the brochure we were told that we would not be allowed to use the Concord name. We were forced to think up another name quickly and so we settled on Flyte. (Interestingly, when later we produced a ‘reverse’ version of Concord, which we called the Mirage, we made no attempt to seek the permission of the French producer of the fighter aircraft of the same name and were never challenged by anyone for its use!)." He has written about the thoughts behind the guitars, the production, the artists like Slade,Mark Griffiths and Mark Bolan and we will follow the Jim Burns story some more years. sixties. Peter Farrell, Factory Manager and James Farrell, Sales Manager in the Burns Ormston Ltd, 1960-65.
to how they tells us obout the character of the young Jim Burns. Peter Farrell - "Jim was a rather funny character, really. He was a very serious man; things had to be perfect for Jim. Nothing was really written down; it was always open face-to-face chats. With the first £50 we borrowed from the bank, we got a little shed down at the bottom of the hill and I used to take the guitar bodies down and shape them and sand them. But it was only small, and now and again Jim would be down there in the afternoon, because we could only be one in there or we would be in each other’s way. And that is when we moved up to 131 Queens Rd. 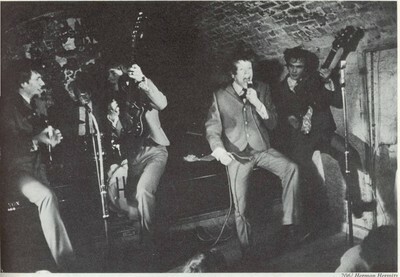 Jim himself, he was really a musician more than a businessman. He had plenty of ideas. We would work during the day, and then at night I would be with Jim and we would be thinking up ways of putting the machines together." We will also show you pictures you never have seen from the early Burns days.